The Australian Association of National Advertisers (AANA) kick started Global Marketer Week by announcing the winners of the inaugural Great Australian Marketing Awards (The GRAMAs). “We are delighted to showcase our home-grown talent, the great ideas and the fantastic campaigns that have left a mark on the global stage” s AANA’s CEO Sunita Gloster said in a statement this morning. Great Australian Marketing Talent in a global/regional role was awarded to Leanne Cutts, president and managing director Japan Mondeléz International. “Time and time again, Leanne has delivered top class result in markets as different as India, Japan, Taiwan and Korea. Most recently, she was instrumental in the launch of Stride Gum in China, which is now viewed as one of Mondeléz’s most successful ever FMCG campaigns,” Gloster said. Mc Donald’s McCafé took out the Great Australian-conceived product/service. “There are now more than 700 McCafés in Australia and they now operate in over 32 countries, including the USA. McCafé is the only international café chain to have originated in Australia,” Gloster commented. The late Charlie Bell, the first non American and youngest person to hold the position of global head of McDonalds was the driving force behind the expansion of McCafé. The award was collected by Jo Taylor on behalf of McDonald’s. The GRAMA for most successful international marketing campaign was awarded to Ogilvy for ‘Share a Coke’. 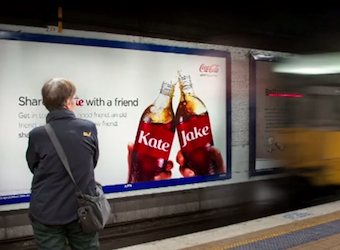 “Since its debut in Australia in summer 2011, versions of the ‘Share a Coke’ campaign have run in the UK, Brazil, China, Croatia, Holland, Denmark, France, Germany, Greece, New Zealand, South Africa, Spain and Sweden. A further 60 countries are planning to launch the campaign in 2014,” Gloster said. Coca-Cola’s Global chief marketing officer, Joseph Tripodi, in the GRAMA submission said it was “A world class example of…an idea that transcends borders and cultures. Australia proved that commitment to taking a brave idea to market can drive both the numbers and earn our brands disproportionate share of popular culture”.